The Bay Bridge meshes beauty with functionality and a high price tag. – Sunne Wright McPeak, California Business, Housing and Transportation Secretary, Arnold Schwarzenegger appointee. In late 2004, California Governor Arnold Schwarzenegger announced that as part of statewide budget cuts, the design of the new eastern span of the San Francisco-Oakland Bay Bridge would be dramatically scaled back. At the time, estimates of the new span’s cost had risen to $5.1 billion from an initial estimate of $1.3 billion. Instead of a single-tower “signature span,” Schwarzenegger proposed a towerless concrete viaduct—a slightly raised road across the water that was compared (unfavorably) to a freeway onramp. The span is being rebuilt because of longstanding concerns by Caltrans and state civil engineers about its seismic integrity. Part of the existing structure collapsed during the Loma Prieta earthquake in 1989, and since then the bridge has been considered unstable, although it has remained open because it is indispensable to Bay Area traffic flow. The eastern span has long been a sore spot for East Bay civic leaders, who consider its charmlessness— especially as compared to the Golden Gate Bridge, or even the western span of the Bay Bridge—an aesthetic affront. Its new design, arrived at after considerable community input and debate in 1998, was widely praised as elegant and seen as correcting a longstanding geographic disability. 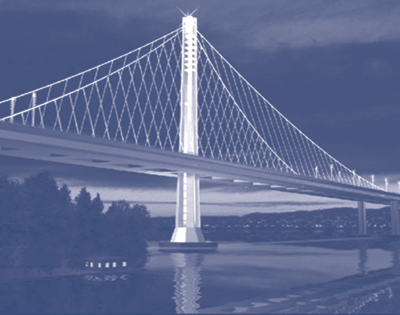 After protracted negotiations between Bay Area lawmakers and the governor, the signature span design was reinstated in 2005, but an important planning and policy question remains. What role should aesthetics play in the design and funding of such a massive civil engineering project? Is a good-looking bridge worth a higher price tag, and if so, who should pay for it? The first toll bridge in the United States was built across the Charles River in 1785, connecting Boston and Charlestown. The Massachusetts legislature granted a charter to the Charles River Bridge Company, a private corporation, under terms that required the company to fund and build the bridge, to collect and keep tolls for forty years, and then to turn the bridge over to the Commonwealth. The Charles River Bridge contract seemed an easy call for the state legislature to make—they wanted a bridge, and the private company wanted a chance to make money. It was not obvious that toll bridges would make any money; the previous American experience with toll roads had been, in the words of economic historians Daniel Klein and John Majewski, “limited and lackluster.” But the Charles River Bridge was on the same location as a financially successful ferry crossing, and it paid back its investors at a rate of thirty to forty percent annually. Its success inspired a boom in toll bridge construction—over the next thirteen years, some 59 toll bridge companies were chartered in the northeast alone. For early toll bridges, the impetus behind their construct economic, both for the private financiers and for the govern granting charters. Largely absent from bridge financing were concerns about aesthetics. The development of covered wood bridges in America illustrates this point nicely. The covered bridge, though not invented in America, reached its apogee here in the mid-nineteenth century, and is celebrated today as a beautiful, albeit obsolete reminder of early American design history, and a melding of function and form. The real story about how covered bridges came to be, however, is rather less romantic. The first covered bridge in America, Philadelphia’s privately financed 1805 Schuylkill Permanent Bridge, was not intended to be a covered bridge at all. Its original design called for an uncovered stone bridge, but the builders determined that tolls would never pay back the cost of the stone. The building material was changed to wood, with a cover added solely as a protective measure. According to a latter-day account of its construction, the cover “compelled ornament, and some elegance of design, lest it should disgrace the environs of a great City,” and so the wooden covering was coated with imitation stone. This additional design feature did not exactly break the bank. In 1805 dollars, the total cost of the bridge was $300,000—at the time, the costliest private structure in American history. The cost of the ersatz stone coating was less than $50. Covered bridges were soon built all around the Northeast, but the rationale underlying this fad was strictly economic: covered bridges were deemed to last three times as long as uncovered bridges. Although today the bridges draw travelers’ interest as beautiful, charming objects, their aesthetic design derives from their function, in this case durability. 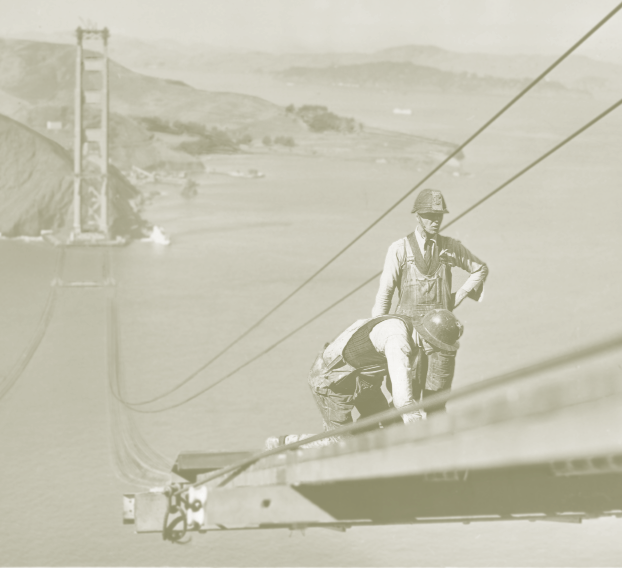 Throughout the nineteenth and twentieth century, the US cemented its position as the worldwide leader in building innovative bridges, as well as in the quantity of new bridges overall. The main reason for this trend was economic, although geography and culture played roles as well. Unlike the largely deforested European continent, the US was timber-rich and capitalpoor in the 1800s, with many carpenters and few stonemasons. Early American bridge designers were thus able to experiment with and implement wooden truss designs to a degree that the Europeans simply were unable to match. Subsequently, with the increasing dominance of the American iron and steel industries, Americans began to construct metal bridges, employing innovative chain link and suspension designs. (Although American James Finley is credited with having built the first practical suspension bridge in 1796, the US did not begin to build suspension bridges in earnest until the mid-1800s, after European bridge builders had made several substantive improvements to Finley’s basic design.) 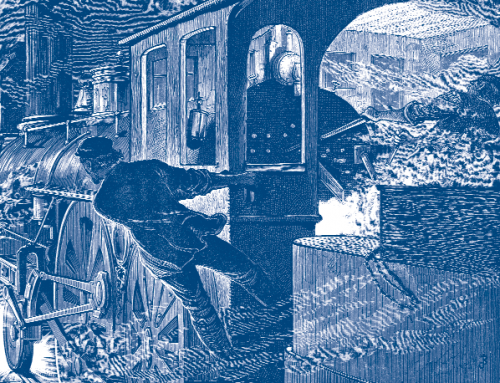 During the nineteenth and twentieth centuries the US experienced two successive, extended frenzies of bridge building: first with the construction of the transcontinental railroad system, and then while building roads for ever-increasing numbers of automobiles. 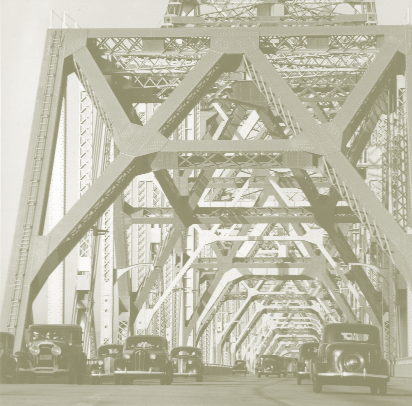 Up through the Great Depression, most toll bridges were privately financed. Since 1929, however, almost every new bridge in the US has been publicly financed. In 1928, the American Institute of Steel Construction’s annual Artistic Bridge Awards began to call attention to the value of beautiful bridges. Today dozens of local and national awards go to innovative or attractive American bridges. It’s unclear to what extent these are selfcongratulatory awards given by engineers to other engineers, but as noted American bridge engineer D. B. Steinman made clear in his 1952 article, “How Bridges Have Increased Man’s Mobility,” by the middle of the twentieth century the idea that bridges could and should be both functional and beautiful was firmly ensconced in the minds of bridge designers and the public. The Golden Gate Bridge is perhaps the most famous bridge in the world today. It is featured on postcards, T-shirts, and inside snowglobes. It has been celebrated in poem and song. It has been the main plot device in a James Bond film. It has its own United States postage stamp. It has been called “matchless in its Art Deco splendor,” a man-made object whose “soaring grace enhances the beauty of its natural setting,” and “the largest work of art in history.” And this is not simply the puffery of local boosters: the Golden Gate Bridge gift shop takes in nearly $3 million annually. But how did this all come to pass? Did the builders of the Golden Gate Bridge (or the citizens who paid for it) know what they were creating? The Golden Gate Bridge’s website would have you believe that a great deal of thought went into the design of the bridge. This is true, of course, but little of that thought was geared toward aesthetics. Geographer Brian Godfrey argues that both the Golden Gate and Bay Bridges were proposed for economic and logistical reasons: first, to relieve traffic at the ferries; second, as part of the civic competition with Los Angeles; third, in recognition of the burgeoning power of the automobile; and fourth, upon the realization that San Francisco’s peninsular isolation was becoming increasingly less romantic and more inconvenient. Most accounts have it that noted bridge engineer Joseph Strauss took on the construction of the Golden Gate Bridge as the greatest challenge of his career. His contemporaries considered spanning the treacherous Golden Gate to be either impossible or so difficult and expensive as to be practically impossible. Strauss’ original plans for the Golden Gate Bridge called for a complicated hybrid cantilever-suspension bridge—a design that has since been reviled as ill-conceived and ugly. Although his initial estimate of $17 million was appealing, the design was untested and it soon became clear that if built as planned, the bridge would cost significantly more and might not even be structurally sound. Strauss’ alternative design, a less expensive, clean-lined suspension bridge—the design that ultimately came to be built—was the result of economic necessity rather than a quest for beauty. In other words, the Golden Gate Bridge was designed to be the cheapest, most simple bridge possible. The bridge will pay for itself out of tolls. These tolls will redeem the bond issue, pay all interest, pay for maintenance of the bridge and accumulate a vast profit—not less than $17,242,800, within the forty-year period. It is the consensus of opinion of all who have studied the subject that the construction of this span will increase property values not only in the territory tributary to the bridge, but throughout the entire metropolitan bay area…. The Golden Gate Bridge is based on the most rational of all methods of taxation, namely, the user’s tax. Not one word of the brochure addressed the design or appearance of the bridge. 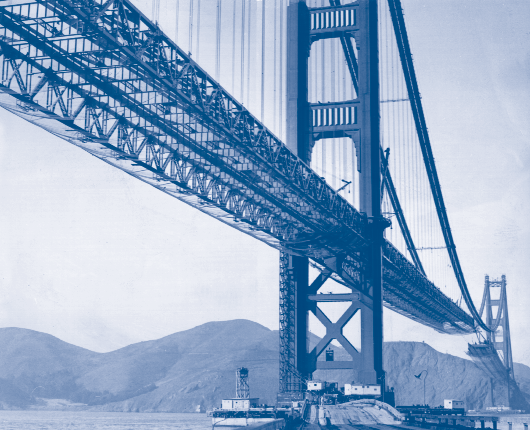 The 1930 campaign brochure promised that after the bonds were paid off, the Golden Gate Bridge would become free. In 1969, the bonds were almost paid off and the Golden Gate Bridge District had nearly $23 million in reserves, but traffic on the bridge was close to capacity. 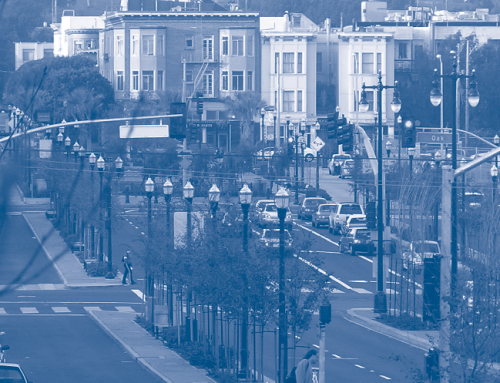 At this point, the state legislature authorized the district to use its reserves to provide public transit for the San Francisco-Sonoma corridor. By 1972, the district provided both bus and ferry service across the Golden Gate. According to Golden Gate Bridge, Highway, and Transportation District data, since 1972 the average daily bridge vehicle crossings have only risen from 94,344 to 106,456, with an additional 14,323 people now crossing via transit. However, it is also true that Marin County has been losing population, the number of Golden Gate Transit riders has been declining, and the bridge toll has increased to $5 per vehicle. At the same time, the district has had a significant budget deficit for several years, and is considering such measures as raising the toll to $6 per car, charging pedestrians and bicyclists to cross the bridge, and eliminating free passage for carpools and low-emission vehicles. 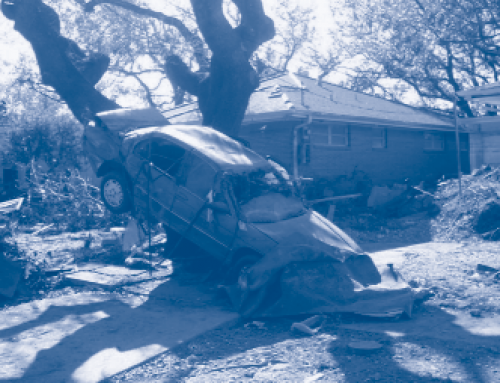 The primary reason for the shortfall has been attributed to the cost of capital improvements and increased insurance costs (in the wake of the 1989 earthquake and 9/11, respectively). But the district’s financial statement reveals that if it were not funding public transit, the bridge would be making a profit. The San Francisco-Oakland Bay Bridge has long been the unglamorous sibling of the Golden Gate Bridge. Although its suspension bridge west span, from San Francisco to Yerba Buena Island, is considered “handsome, if conventional,” the cantilevered east span, from Yerba Buena Island to Oakland, has been called “probably one of the ugliest bridges in the United States.” The Bay Bridge was featured on a stamp, but only as the untitled background to a 1947 airmail issue. It is not a tourist destination, and does not have a gift shop. 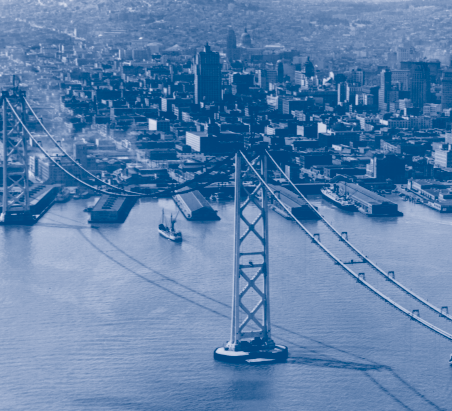 In 1939, San Francisco hosted a world’s fair on Treasure Island, a man-made island in the middle of the Bay Bridge created from earth excavated during the bridge’s construction. The name of the fair? The Golden Gate International Exposition. 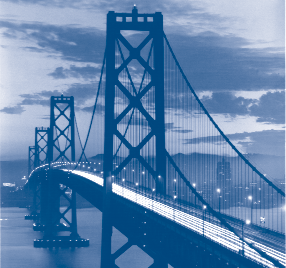 From the beginning, the Bay Bridge project was significantly more ambitious than the Golden Gate Bridge. When completed, it was the longest, heaviest, deepest, and most expensive bridge ever built. It was considered an essential transportation link in the state economy, and as an official state project (unlike the self-financed Golden Gate) had little difficulty gaining funding. But pure functionality did not completely rule the day: the Bay Bridge’s original design, a matched set of cantilevered bridges, was unacceptable to influential San Francisco residents. A suspension bridge was also considered for both spans, but the geology of the bay rendered a suspension design on the eastern span considerably more expensive. Local historians note, however, that as long as San Franciscans’ view of the cantilevered portion was blocked by Yerba Buena Island, city residents had no problem with such a design. And so the San Francisco half became a pleasing suspension bridge, while the Oakland half remained a graceless cantilevered span. Did the people of Oakland believe they were getting an ugly bridge? 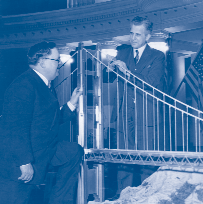 It’s instructive to note that the Bay Bridge was designed by California’s State Highway Engineer, Charles H. Purcell, and that irrespective of any ostensible aesthetic shortcomings, the bridge was considered an engineering marvel. In fact, in 1956 it was named one of the seven engineering wonders of the world. 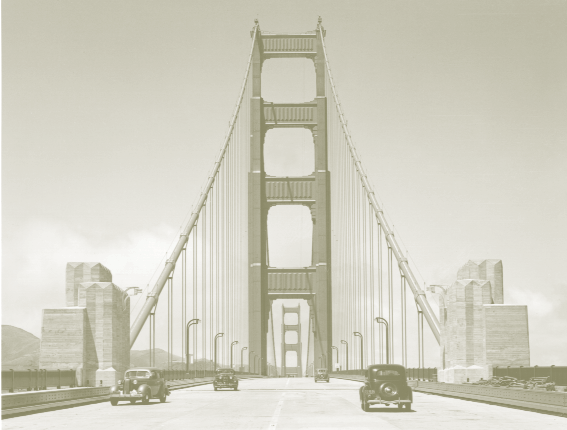 Considering Strauss’s original design for the Golden Gate, it would be easy to ascribe the aesthetic differences between the two bridges to mere serendipity. But it also seems that the difference in engineers was crucial: Strauss designed bridges for a living, whereas Purcell designed highways. Although it would be fatuous to presume that either Strauss or Purcell were solely responsible for the design of their respective bridges, each one was ultimately responsible for its look. The Bay Bridge cost $77.6 million, paid for by a series of government bonds. 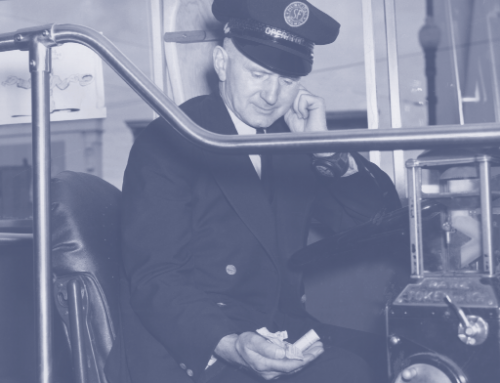 From the day it opened to vehicular traffic on November 12, 1936, it has been the workhorse of Bay Area transportation. This is no surprise; the ferry crossing it replaced transported over 46 million passengers annually. Currently, nearly 100 million total vehicle crossings are made on the Bay Bridge each year; by contrast, slightly less than 40 million vehicle crossings are made on the Golden Gate Bridge. The Bay Bridge’s tolls paid off its bond debt within twenty years. Since that time its net revenues have been controlled by the Metropolitan Transportation Commission (MTC), the Bay Area’s regional transportation planning organization. Bay Bridge revenues funded its 1958 reconstruction (when the Key Route streetcar tracks were removed from the lower deck and all lanes were converted to vehicular travel), as well as construction of the San Mateo and Dumbarton Bridges. 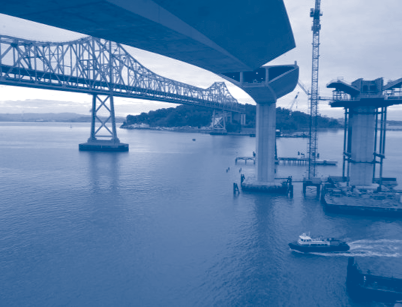 Since those projects were completed, the lion’s share of net Bay Bridge toll proceeds have gone to public transit, including BART, San Francisco’s MUNI bus and trolley system, and Alameda County’s AC Transit bus system. After the 1989 Loma Prieta earthquake, which caused part of the Bay Bridge east span’s upper deck to collapse, Caltrans inspected the entire bridge and determined that most of the east span was seismically unsound. Designated a “lifeline bridge” for its crucial role in everyday traffic flow as well as in emergency scenarios, the Bay Bridge jumped to the top of the state’s list of structures needing seismic work. A Caltrans study determined that although a retrofit was plausible for the east span, a more cost-effective solution would be to build an entirely new bridge. Bay Area politicians, seeing an opportunity to address the aesthetic injustice inflicted on the East Bay since 1936, leapt at the chance to design a new east span. This time, they vowed, Oakland would get its own worldclass bridge. First, Caltrans came up with a proposal for an elevated skyway that looked substantially like an extremely long freeway ramp. Not good enough, responded the MTC. After several years, numerous advisory committees, and a full-blown design competition, the MTC in 1998 opted for a higher, fancier skyway rising to a “signature span” on the west end. This signature span, so-called because of its bold, distinctive design, would be a self-anchored suspension bridge, with only one tower and cables wrapping entirely around the roadway. It would be the largest such bridge in the world and the first one in the United States. But it was this signature span, this chance for the Bay Bridge to step out of the Golden Gate’s long shadow, that caused all the trouble. The entire eastern span was originally budgeted at $1.3 billion. Currently, the signature span alone is estimated at $1.5 billion, with the entire eastern span at $6.3 billion. When the signature span’s design was initially approved, it was vetted by a panel including engineering professors and Caltrans employees. Since then, it has been alternately attacked as a waste of money, unbuildable, and possibly even unsafe. The latter two arguments never gained much traction, but the former argument was at the heart of Schwarzenegger’s objection. Part of the problem was that the signature span was designed at the height of the Internet bubble, when the Bay Area was riding high economically and the state enjoyed a sizable budget surplus. It didn’t help, though, that steel prices subsequently skyrocketed and that then-Governor Gray Davis had included a “Buy American Steel” provision in the bridge contract. It didn’t help that terrorists attacked the country on 9/11, sending insurance and bonding costs to unforeseen heights. It didn’t help that only one construction company bid on the signature span. It certainly didn’t help that Caltrans underestimated costs, paid millions of dollars to outside consultants, and failed to communicate any of this to state legislators. Meanwhile, the reason for building the new bridge in the first place—to make the Bay Bridge earthquake-safe—is no less pressing. According to the United States Geological Service, there is a 62 percent chance that a major earthquake will hit the Bay Area in the next three decades. When Schwarzenegger rejected the sole bid for the signature span, he insisted that if Bay Area residents wanted anything but the plain skyway, they would have to pay for it themselves. 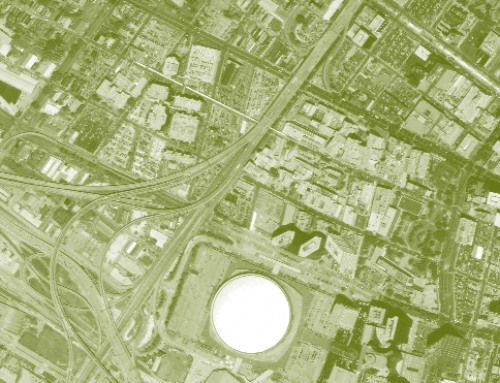 According to his estimates, the original Caltrans proposal would save $300 to $400 million. Bay Area lawmakers contended that the governor’s proposal would require a new set of plans and environmental reviews and might even cost more, and that in any event the state ought to pick up the tab as a seismic repair, because the Bay Bridge was part of the statewide transportation network and was state-owned to boot. The debate soon reduced to finger-pointing: state officials accused Bay Area lawmakers of placing aesthetic concerns over safety, while Bay Area lawmakers accused state officials of placing financial concerns over safety and throwing in an ugly bridge as part of the bargain. In July 2005, the parties compromised: the state provided some extra money, but also turned control of the project over to the MTC, which would pay for the remainder (including any future cost overruns) by floating bonds and increasing tolls on Bay Area bridges. In February 2006, the suspension span contract went out to bid again. The new Bay Bridge can only be thought of in the context of the Golden Gate Bridge, for without the Golden Gate there would be no signature span. But the Golden Gate Bridge, lauded today as an artistic triumph, was primarily a product of efficiency and minimalism, with a design borne largely of economic necessity. In this respect it stands as a proud inheritor of the tradition of American bridge-building, dating back to the first covered bridge: a public work whose beauty is intertwined with its functionality. That is not to say that any bridge whose form results from economic and functional necessity will be hailed as a work of art. If the Bay Bridge had been built with two cantilevered spans, as originally planned, it would have been just as much a melding of form, function, and economy as the Golden Gate Bridge, yet arguably would have been even more loathsome. Perhaps the problem is a failure of imagination, but aesthetic beauty is, as ever, in the eye of the beholder. Bridge builders have always seen the Bay Bridge as a work of art. The rest of the Bay Area can’t wait to get rid of it. It seems appropriate, then, that they will be paying for their chosen design by way of increased bridge tolls. At any rate, Bay Area residents can no longer claim that the Bay Bridge never gets any attention. It featured prominently in the news for much of 2005. It even has its own movie making the rounds at film festivals: The Bridge So Far, a documentary chronicling the struggle to rebuild the east span. Construction on the east span is now slated to be complete in 2012. No matter how the signature span is received, the Bay Bridge will surely be back in the news at that time, to reclaim its title as the most expensive bridge ever built. “Bridging the Bay: Bridging the Campus.” UC Berkeley Library. April 18, 2001. 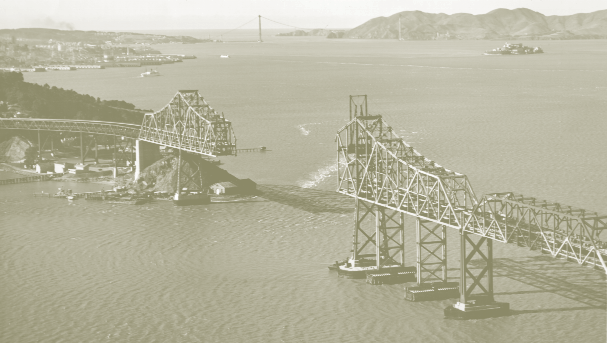 “Golden Gate and San Francisco-Oakland Bay Bridge Construction,” The Virtual Museum of the City of San Francisco. Henry Petroski. Engineers of Dreams: Great Bridge Builders and the Spanning of America (New York: Alfred A. Knopf, 1995). Eric Sloane, “The First Covered Bridge in America,” Geographical Review, no. 49, pp. 315–321 (1959). D. B. Steinman, “How Bridges Have Increased Man’s Mobility,” The Scientific Monthly, no. 75, pp. 207–214 (1952).